At dawn, a sleepy fairy emerges from on a red rose where she spent the night. Yawning, stretching and trembling with happiness, she slowly awakes to a day full of hope. The artist signs the figurine with his initials. Please note that no butterfly is harmed for the production of this fairy. The butterflies are non-threatened species reared in farms. After they have lived their natural lifespan and left our world, their wings are collected and dipped in resin for preservation. 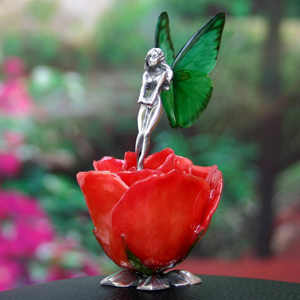 The genuine rose is also dipped in resin for preservation.